The future of tennis may just be in a little foam ball - perhaps with a modified court and scoring. Known as QuickStart, local tennis pro Jason Metz has taken the national USTA program to another level in Central Arizona, exposing hundreds of children to the sport through innovative after-school programs. The QuickStart tennis format, and Metz’s variation on it, is designed to help children find success from the very first swing. QuickStart appropriately scales down all aspects of regulation tennis — including equipment, court dimensions, and scoring — so that the game becomes specifically tailored to their age and size. The format is broken out into two age groupings, for children ages 10-under and for those who are 8-under, similar to models used successfully in other youth sports such as youth baseball. Metz brings all the equipment to schools in three school districts for a turn-key experience for the kids and parents; kids who perhaps wouldn’t be exposed to tennis otherwise. actually learning the skills necessary to succeed. As players become more proficient, they also have an opportunity to compete against other QuickStart players through Metz’s Skills & Drills Team Tournaments. At the last event in December, more than 75 players representing 30 different elementary schools participated. Players are given an opportunity to compete even though they have not yet mastered all the strokes to play a match. The hope is to get kids excited about playing tennis and provide them with an opportunity to be on a team and represent their school. Metz took some time out of his busy schedule to talk with the Junior Council of USTA Central Arizona to offer his thoughts on the program and its future. 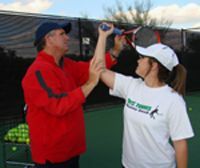 USTA CENTRAL ARIZONA: Our understanding of QuickStart brings kids into the game by utilizing special equipment, shorter court dimension and modified scoring. What else do we need to know about the program and what are the benefits? they only have to pick up after the activity. The kids come straight from school when the day is over. By making it easy and convenient, and bringing the sport to them, many more try it and are exposed to the sport of tennis. USTA CAZ: What is your involvement locally? J.M. : Locally, I am currently in three school districts with about 500 currently participating. I estimate that there have been thousands who have tried tennis over the past two years. Some have continued on and that is the goal to expose them to the sport, find out has an interest and help them to develop their skills to play on a team, be in USTA, high school, college, or an adult league later in life. USTA CAZ: Do you think QuickStart has the potential of creating a tennis renaissance, the way soccer and golf have exploded the past decade or so? J.M. : I do believe that Quick Start has the potential of expanding tennis. The more children we can get involved, the better they will strive to be, and this will only increase the interest nationally. The future of the sport is through children. USTA CAZ: Tell us more about the Skills and Drills event you hosted in Scottsdale. J.M. : The whole concept behind Skills & Drills event was because I wanted to create an exciting environment for kids similar to the NBA All Stars Event, where the kids could complete even though they did not have the complete skill set to play a match. I incorporated the team idea, because everyone wants to represent their school and be part of a team. The more kids that participate the better the teams’ chances of winning, because every point counts. USTA CAZ: How often do you plan to host those? J.M. : We are trying to host the Skills & Drills quarterly. USTA CAZ: What is the Junior Team Tennis Developmental League? J.M. : My concept of the tennis developmental league is so kids can compete against one another without having a complete game. This is a step up from Skills & Drills where we are preparing them to play in a USTA league. Every week we work on a particular part of the game and then have a drill that relates and keep track of the score. USTA CAZ: How can kids, parents and coaches get involved in QuickStart and Developmental League? J.M. : As far as parents and coaches, they can get involved by volunteering their time to help during the events. It takes lots of manpower for registration, score keeping, etc. USTA CAZ: Tell us more about your background and Metz Tennis. J.M. : I started playing when I was 16 in Eugene, Oregon. I had played all the major sports and when I tried tennis, I fell in love with the game and could not get enough. I went on to play college and professional satellite tournaments. Because	of an injury, I had to leave the professional game and started coaching. I have coached in Oregon, Colorado, Hawaii and Arizona. While in Scottsdale, I started Metz Tennis for teaching junior tennis at two private schools, as well as my own junior program at Gainey Ranch. I then grew the concept, by taking "grassroots" tennis to the public schools, where my staff and I teach in three school districts with over 500 students, as well as offering a beginner, intermediate, and advanced program at the JW Marriott Desert Ridge. Our plan is to continue to branch out and add more school districts, charter and private schools throughout the valley. • Racquet size: For 8 and under, 19-, 21- or 23-inches. For 10 and under, 23- or 25-inch. • Court dimensions/net: For 8 and under, a court that is 36 feet long and 18 feet wide. Portable nets that 18 feet long and 2 feet, 9 inches high. For 10 and under, a regulation net and 60-foot court. • Scoring: For 8 and under, there are seven points in a game, two out of three games in a match. For 10 and under, best of three modified sets. The first to win four games wins a set. En lieu of third set, the first player to win seven points wins the match. 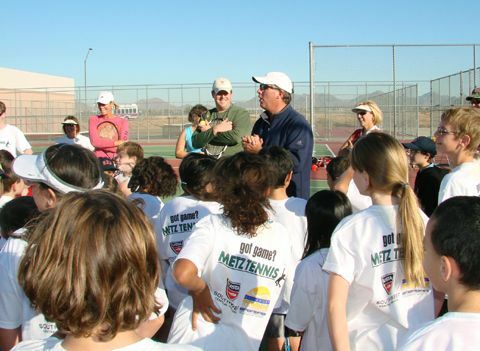 For more information, contact Jason Metz at (480) 656-3346 or visit www.metztennis.com.